Who knew a whisky sour could work so well with sloe gin! Malty, citrussy, sweet and smooth, this drink tastes and looks great. 1. Put all the ingredients in a shaker and shake without ice. The shake again with ice. Double strain over a block of ice in a rocks glass. 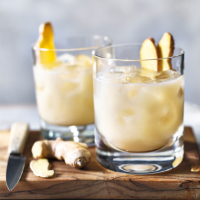 Garnish with a long slice of fresh ginger.